To add a new ShiftNav panel, go to Appearance > ShiftNav. 1. 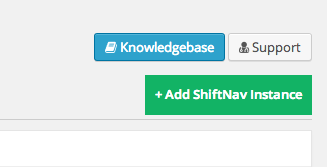 Click the green + Add ShiftNav Instance button in the upper right corner. 2. Give your new instance an ID. IDs should only include letters, hyphens, and underscores. If you include invalid characters, your ID will be automatically sanitized. 3. Click Create Instance. Your new instance will be created. To see the instance, click the Refresh Page button. If you have changes that you need to save before refreshing, click close and save your changes. Click the tab to view the options for your new panel. 5. Assign a menu to use for this panel. Either assign a menu directly via Display Menu or via a Theme Location. Both are set in the image only for illustrative purposes; in practice, setting both would be pointless as only one can work at a time, and Display Menu takes precedence. 6. Add a toggle to your theme template or page content to provide users a way to open and close the panel. The appropriate toggle code for that instance is provided at the top of the tab.